Shower cap in Trefle by Kokka. Trimmed with handmade bias binding. Do you need a new shower cap? Would you like to donate to a good cause? 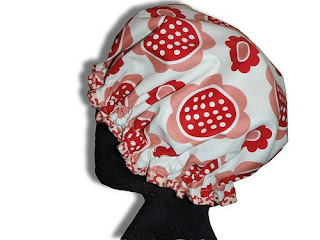 I am having a handmade shower cap giveaway, as part of Make It Perfect's Queensland Flood Appeals Auctions. For every $5 donation made to the Premier's Flood Relief Appeal I will give you 2 entries in the giveaway. If you are the winner, you will receive either this handmade shower cap ... or I will make a custom cap that suits your taste. I will also pop in some bathing goodies, to complement your new shower cap. All you need to do is make a donation to the Queensland Government's Premier's Flood Relief Appeal and then leave a comment here with your receipt number. If you would like to enter more than once, please leave a separate comment with each receipt number. If you could ensure that there's a way I can contact you through a blog or e-mail address, that would be great. I am happy to post worldwide. I will randomly draw the winner next Wednesday 26th January 12 midday (Australian eastern standard time). Any questions? E-mail me at liesl[at]hoppobumpo[dot]com. Please look at the huge list of auctions over at Make It Perfect. If my shower cap doesn't appeal to you, then I am sure you will see something amazing over there that will! Update (26 January 2011) : congratulations to Cathie of Melbourne Epicure who won the draw. A big thank you to everyone who entered and for your generous donations to the Premier's Flood Relief Appeal. If I win I'll be wanting a green one!? I'm getting so quick at filling out that donation page...... so many raffles to enter!!!! #3204094 and as the already proud owner of one of your shower caps, I am giving my "tickets' to the next commenter...who also donates. thanks Liesl. receipt no. 3213541. Just the other day I thought this is what I need for showering three girls and not having to contend with three lots of wet hair! oh i hope i win it!! Yippee! I would love to win one of your super gorgeous shower caps.